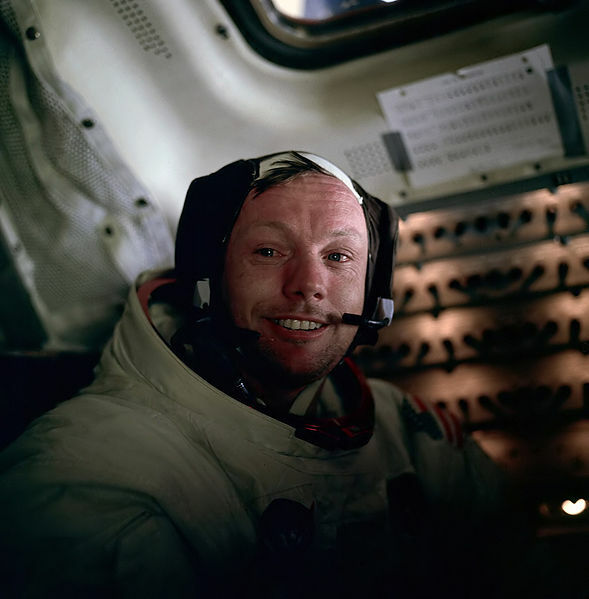 Neil Alden Armstrong was born on August 5, 1930 in Wapakoneta, Ohio. He was the eldest of the three children of Stephen Armstrong and Viola Engel. Stephen Armstrong served as an auditor for Ohio's government and the family was constantly moving around the state during Neil's childhood. In 1936, when Neil was only 6 years old, he had his first plane ride in a Ford Trimotor. As a child, Neil Armstrong became a Boy Scout, eventually acheiving the rank of Eagle Scout. In 1947, Armstrong studied aeronautical engineering at Purdue University. In 1949, the Navy called up Armstrong and sent him to the Naval Air Station Pensacola. In 1950, Armstrong became a fully qualified Naval Aviator. A year later, Armstrong went into combat in the Korean War, where he earned the Air Medal, a Gold Star, the Korean Service Medal, and the Engagement Star. Armstrong left the Navy in 1952 and went back to Purdue to finish his degree. While at Purdue, Armstrong met Janet Elizabeth Shearon, to whom he would get married to in 1956. The couple would have three children together. After Armstrong graduated from Purdue in 1955, he became a test pilot in the Lewis Flight Propulsion Laboratory. Armstrong flew several types of planes, and by 1957, he started flying rocket planes. He soon became involved in flying X-15, logging 2,400 flying hours before he retired as a test pilot. Armstrong became part of the Man in Space Soonest program in 1958. In 1960, he became further involved in space travel when he became a pilot consultant for the X-20 Dyna-Soar military space plane and later became one of the six pilots to fly the plane when finished. In 1962, Armstrong also applied for a position as a potential NASA astronaut and was quickly brought into the program. Armstrong became involved in the Gemini program and was assigned as the Command Pilot of Gemini 8. He also was the backup pilot for Gemini 11. In 1968, Armstrong was named as the head of the Apollo 11 mission to the moon. He would be flying to the moon with Buzz Aldrin and Michael Collins. The three left for the moon on July 16, 1969, arriving on the moon four days later. Armstrong and Aldrin took the landing ship. Eagle, down to to the moon's surface. Armstrong's step onto the moon made him the first man to walk on the moon. It was here that Armstrong said "That's one small step for [a] man, one giant leap for mankind." Armstrong and Aldrin spent about two and a half hours on the moon, during which they tested human capabilities on the moon, planted the American Flag, left memorial items to deceased cosmonauts and astronauts, and had a minute and a half long phone call with Richard Nixon. After coming beck to Earth, Armstrong announced that he would no longer fly anymore space missions. He took up a teaching position at NASA and later at the University of Cincinnati. He also served during several NASA accident investigations. Armstrong rarely made public appearances, though he did do several television commercials, and he refused to give out autographs. Armstrong had several health problems during his later life, including having the tip of his ring finger ripped off, though he had it surgically reattached. Armstrong died after undergoing surgery to relieve blocked coronary arteries. He died on August 25th of that year due to post-surgical complications. Neil Armstrong is on our list because his actions on the moon led the world into a new era and changed the size of the world where humans could go. Armstrong's accomplishment on the moon really was one giant step for mankind.